A small dishwasher can be ideal for small apartments and those living in a household of only one or two people. Even with limited space, owning a compact dishwasher can help save time instead of washing dishes by hand. Typically, small dishwashers are about half the size of a standard dishwasher and come in a number of designs, including slimline, built-in, single drawer and benchtop. Read on for a full review of compact dishwashers available in Australia. Why buy a small dishwasher? How much do small dishwashers cost? A small dishwasher can range from $400 up to almost $3,000. On the lower end of the price scale you’ll find machines that are suitable for small scale dishwashing, such as the benchtop design. The higher end models feature additional functionality and typically higher energy efficiency ratings. Depending on the specific design you’re interested in, there are a number of brands that cater for small living spaces, featuring a number of compact dishwashers. The Esatto range has been designed by Australians, for Australians. The Esatto DW42CS 45cm slimline dishwasher has a stainless steel finish and features 10 place settings, suitable for four or more people. It has a straightforward interior design featuring a cutlery rack, upper basket and lower basket. The sleek control panel is claimed to be easy to clean and allows users to select one of seven wash programs, including pre wash and Eco mode. Additionally, the extra dry option is boasted to enhance the drying finish without needing to get out the hand towel but it’s not recommended for delicate or soft plastic dishes. The Esatto DW42CS has a 3.5 star energy efficiency rating and according to the Standard Test, it will use around $55 in energy per year. The model is a freestanding unit with cold only water inlets and doesn’t require custom panels or doors. However, it’s recommended you check measurements if you expect to fit it underneath a bench. The machine is backed by a two year domestic parts and labour warranty. 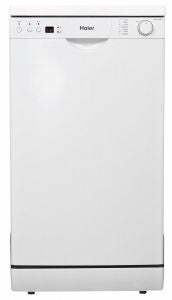 Another freestanding compact dishwasher is the Haier HDW9TFE3WH model with nine place settings, ideal for 2-4 people. The design features a semi-electronic control panel with more traditional turn dial. Furthermore, it’s boasted to have a finger-mark resistant finish. The small Haier dishwasher is equipped with seven wash programs including a rinse cycle, quick wash and a pre wash option, and is boasted for a 52dB noise level when working. Additionally, it features an extra hot setting for pots and pans. 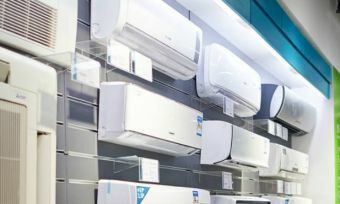 This model has just two stars for energy efficiency, which can in turn add around $84 to your electricity bills each year. It uses 12L per cycle, giving it a 2.5 star water efficiency rating. For safety, it’s equipped with a counter balanced door and overflow flood protection. Similarly to the other slimline dishwasher, it has a two year warranty on parts and labour. Bosch dishwashers are more ‘upmarket’, with prices above the $1,000 mark in the compact range. 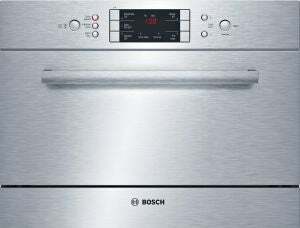 The Bosch SKE53M05AU 60cm under bench dishwasher is suitable for 1-2 people with its six place settings. It has a stainless steel finish with an LED display and push button control. It features four foldable racks and allows for a plate size of up to 28cm. While it’s limited on the wash programs with offering just five, it still includes a heavy cycle and express wash option, as well as an extra hot 70°C setting for pots and pans. 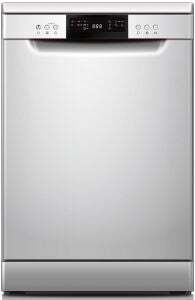 The Bosch compact dishwasher has a 49dB noise level when in cycle. For the price, expect an auto load sensing feature claimed to adjust water levels to the amount of dishes loaded, saving on water and electricity. Additionally, it has a delay start function of up to 24 hours and an “Aqua Sensor”, which measures the amount of soiling at the end of the pre-rinsed cycle and reuses water when it can. On a standard cycle it uses 7.2L per wash cycle, giving it a 3.5 WELS water efficiency rating. In terms of energy efficiency, it has three stars and should add around $41 to your annual power bills. A safety feature includes an anti-flood protection system. It also comes with a two year warranty on parts and labour. The Omega 60cm compact dishwasher is designed to be built into kitchen cabinetry without taking up too much space. It aims to provide a seamless built-in look with controls concealed inside the door and stainless steel design to match other appliances in your kitchen. You can select from seven wash cycles as well as choose options to speed up your wash or intensify the clean for heavily-soiled dishes with the pots intensive 65°C wash. It features six place settings including a cutlery basket, rear fold down plate tines and two adjustable cup racks, fitting a plate size of up to 25cm in diameter. 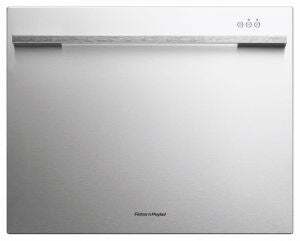 Other features of the Omega OFI101XA dishwasher include a built-in timer to delay the start by up to 24 hours for convenience, which could also help reduce running costs by setting the dishwasher during the off-peak electricity times. Overall, it has a two star energy efficiency rating and should cost around $55 in energy usage per year. For water efficiency, it has a 2.5 stars water rating and uses 8.7L each cycle. While it does include a stainless steel door panel and handle, it’s noted that the door and kick panel can be replaced with your own custom built panel to suit your choice of kitchen cabinetry. Safety features include lockable controls and it comes with a two year warranty on parts and labour. Fisher & Paykel offers several “DishDrawer” dishwasher models, with drawers that open and close in a similar manner to a normal kitchen drawer, as opposed to the standard drop down door. The point is to reduce the bending required from users, with the dishwashers positioned at bench height. 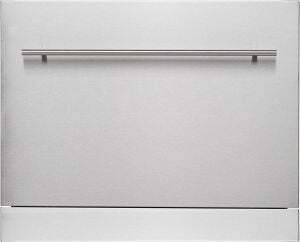 The Fisher & Paykel DD60SDFTX7 single DishDrawer is suitable for 1-2 people. It features seven place settings and can hold plates up to 33cm in diameter. There are nine wash programs in total, including a heavy cycle as well as a delay start option. On a standard cycle it uses 6.7L of water. The design has folding tines, fully adjustable racking systems and accommodates long stemmed wine glasses. Its safety features include a key lock and child lock, as well as anti-flood protection and a fault indicator. It has a 3.5 star energy efficiency rating, using around $39 in energy per year. It is also backed by a two year warranty. Is a small dishwasher right for me? When space is limited in your kitchen, a small dishwasher might provide an affordable and convenient option for you, in particular if you’re living in a small apartment or a household of 1 or 2 people. These small appliances are also ideal if you expect to move home and take it with you. Most are generally cheaper than full sized dishwashers and have an easy installation process, which also reduces costs. However, with some taking up valuable space such as kitchen benchtops or cabinets, you might like to consider which appliances are most necessary. When you’re short on space, a dishwasher can be seen as a luxury. You may also struggle to fit a full load into one of the small dishwashers, especially after a dinner party. Nevertheless, having a mini dishwasher can come in handy for taking care of your everyday dishes – just don’t fall into the trap of paying full-sized dishwasher prices for something half the size! ^By checking latest prices, you may leave Canstar Blue and be taken to a referral partner to compare. You agree that Canstar Blue’s terms and conditions apply to this referral. If you click on a brand that is not a referral partner, you will be taken to a brand page on Canstar Blue.